Overlooking a pretty tree-lined cobbled place - pavement cafés, restaurants, art galeries and a lively nightlife - within sight of the Pompidou Centre, this is a particularly charming apartment in the very centre of the Marais. Picasso Museum, Place des Vosges, banks of the Seine, Notre Dame, Ile de la Cité - and much more! - are all within comfortable strolling distance. Restaurants galore ! (Warning - this is right in the centre of tourist Paris and nightlife sometimes spills noisily onto the pavement late at night.) Direct metro line to the Louvre and the Champs Elysées. In an attractive old well kept building, a fine broad staircase leads to this lst floor apartment (some 55m?) - overlooking the street on one side and a courtyard on the other. Polished wood floors, tall windows, white walls - this bright sunny apartment is in the image of its elegant owner ! 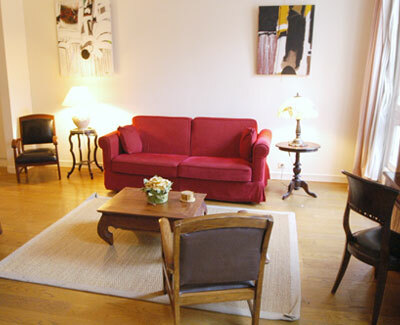 Entrance hall leads to a large living room with comfortable sofa, dining furniture, modern paintings, TV. Opening (no door) to twin bedroom (can be put together to make wide double) with en suite bathroom with WC. Living room and bedroom both overlook the street and have very effective double glazing. Excellent kitchen with breakfast bar, microwave, washing machine. Initial linen included. Local line telephone.